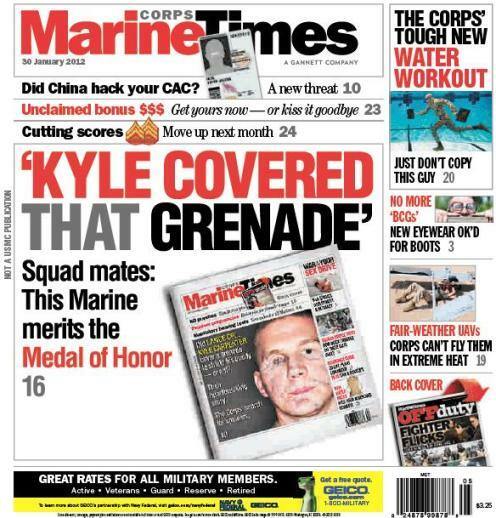 It’s rare indeed that Marine Corps Times will publish back-to-back cover stories on the same subject. Lance Cpl. William Kyle Carpenter’s story is exceptional, though. As I reported last week, the Marine Corps is investigating what happened in the moments before he and Lance Cpl. Nick Eufrazio were hit with grenade explosion in a guard post near Marjah, Afghanistan, on Nov. 21, 2010. Carpenter took the brunt of the blast, and the service is researching whether he deliberately attempted to protect Eufrazio. The story prompted a strong response from our readers — and for several of Carpenter’s fellow Marines present that day to step forward to tell their side of the story. They’re adamant in their response: based on what they saw, Carpenter deserves the Medal of Honor, they say. This week’s cover story reflects that. It outlines what they remember and what the Corps has asked them to do as the investigation moves forward. Combined, the two cover stories share Carpenter and Eufrazio’s ordeal in a way that no other publication has, more than a year later. As we’ve mentioned before, the case is complicated by chance. All of the Marines interviewed for this story were close when the grenade exploded, but could only hear it and respond. Carpenter said he doesn’t remember what happened, and Eufrazio has been unable to speak about the incident due brain damage he suffered as a complication. The issue is on newsstands now beginning today. You can also read it by subscribing here online.